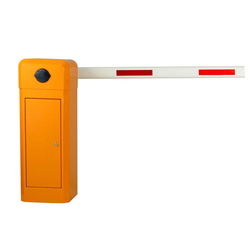 Manufacturer of a wide range of products which include boom barrier (intensive) be 1008 and boom barrier normal use bn 1006.
integrated with car parking system equipments. 5. (Optional) 9. Boom with LED light (Optional) 10. 1. Manual release for power failure. 2. Installation is changeable (left to right). 5. Limit Switch with ensured safety. 6. Radio Frequency based Remote Control.